The Manitoba government is launching a new strategy to reduce poverty and promote social inclusion by partnering with community groups to create jobs for those facing serious barriers to work, Housing and Community Development Minister Kerri Irvin-Ross and Jobs and the Economy Minister Kevin Chief announced yesterday. "There are many barriers that many Manitobans looking for a job face including lack of education and socio-economic barriers. By working together and connecting these people to social supports and job training, the social enterprise sector has been effective at providing a way out of poverty," Minister Irvin-Ross said. "We are going to build on that success story and expand it to offer more people the hand up they need to be part of our growing economy." 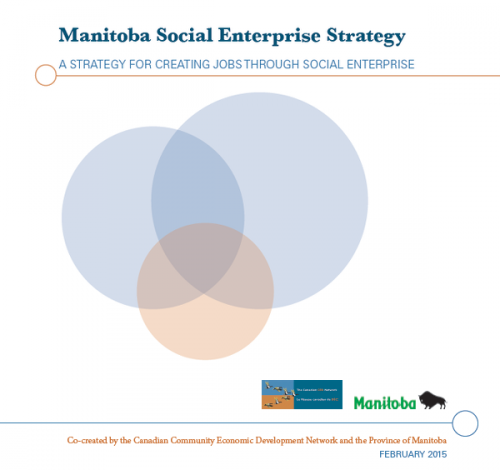 The Manitoba Social Enterprise Strategy is a partnership between community groups, the Manitoba government and the Canadian Community Economic Development Network (CCEDNet-Manitoba). As businesses that focus on social mission, social enterprises are an important part of ALL Aboard: Manitoba's Poverty Reduction and Social Inclusion Strategy, Minister Irvin-Ross said, adding they provide pathways to employment for Manitobans who have been excluded from the labour market, helping to reach the goals of both reducing poverty and adding 75,000 workers to the labour force by 2020. "Whether we've experienced it personally or not, we know poverty creates a lot of challenges for families," said Minister Chief. "Social enterprises are giving people the chance to get their first job, and sometimes even be the first person in their family to get a job. A first job is often the first step out of poverty and the first step in building healthier homes and communities." "We are enthusiastic to be launching this co-created strategy with the province as they recognize the energy and potential of Manitoba's social enterprise sector to create jobs and pathways out of poverty," said Sarah Leeson-Klym, regional director, Canadian CED Network. "We look forward to taking action to grow and strengthen our social enterprise sector as too many Manitobans who want to work are detached from the labour market." "A good example of supporting social enterprises is our partnership with Social Enterprise, Manitoba Housing and Pregnancy and Family Support Services to build 19 affordable housing units at 150 Austin St.," said Minister Irvin-Ross. "The Austin Street Housing is an excellent example of how this initiative supports social enterprises," said Minister Irvin-Ross. "Austin Street will not only provide safe, affordable housing for 19 families in a new, three-storey building built on three vacant lots in the North Point Douglas neighbourhood of Winnipeg, but it will also emphasize the use of a high level of local labour content in its construction. This will allow for opportunities for skill development and local employment in various trades." "We are thrilled to be the developer of a community initiative that supports our work to foster family life, grow community connections and empower individuals," said Cassandra Houle, executive director, Pregnancy and Family Support Services Inc. "The number one family need in our area is access to safe, affordable housing and 150 Austin will provide that, and will provide tenants and residents in the surrounding community a pride of ownership." "We want everyone in Manitoba to have the opportunity to contribute to their community through earning a living in a fulfilling job. We will invest in social enterprises, strengthen services for people facing barriers to work," said Minister Chief. installing energy saving materials and equipment, such as insulation and drain-water heat recovery units, where feasible. implementing eligibility changes to the Workforce Development Program to allow for direct participation by social enterprises.